Simple invoicing & billing software for the business. Create invoices online, make custom invoice templates and keep track of billing with our easy-to-use online invoicing software. With our invoice script you can create a complete and detailed database of all your clients, manage billing and accounting, and request payments via Paypal, Authorize.net or process offline payments through bank transfer or credit cards. With Invoice Manager keep track of billing process and manage client database from any computer with Internet connection. Secure access and user access controls. Import/export client database, print and email invoices, generate reports, set recurring invoices and more. Invoice Manager is fully supported, affordable and scalable solution for those who simple and easy-to-use invoicing software. With a Developer License you can install Invoice Manager on an unlimited number of websites, modify the PHP SOURCE CODE or re-brand the invoicing softwareif they wish! A Developer Licence is an ideal solution for web programmers. You will cut down the expenses while having also the opportunity to extend and build on a professional and stable ground. Regular updates, one time fee & FREE installation support. 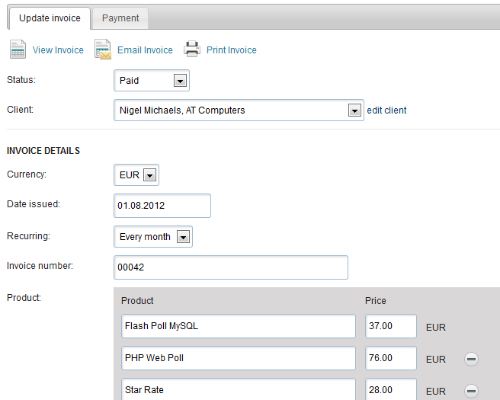 Fully featured FREE Demo is available for this invoicing script. Do you have a web site and customers? Great! Consileri CRM will help you to communicate efficiently with your customers through your web site. Consileri CRM improves the process of communication with customers.